The Nautor Group introduces a new 100 S to join its two Swan 100 FD and RS. This is a sloop with a low deckhouse that comes somewhere between flush deck and raised saloon versions. The waterlines are the same as the two 100 FD and RS craft and are capable of high level performance and sailing qualities. Like all yachts group by the group led by Ferragamo, the Swan 100 S also has all the qualities necessary for winning in the famous off-shore regattas for cruising maxis. Its sail surface is divided up between spanker, 110% genoa and staysail, with the possibility of adding no less than 762 square metres of spinnaker on downwind courses. The deck is characterised by a sporty deckhouse and by the wonderful, well-made teak deck. The cockpit is divided into two areas, one in the bows fitted out with small tables and two identical C-shaped sofas facing each other, and a stern given over to controls, where we find double wheelhouse and all the auxiliary sailing aids and rigging, such as electric winches, GPS, autopilot and others. On the lower deck we have two separate zones. Layout guarantees privacy between the part dedicated to the owner and his guests and that exclusively for the crew, located in the far bows. 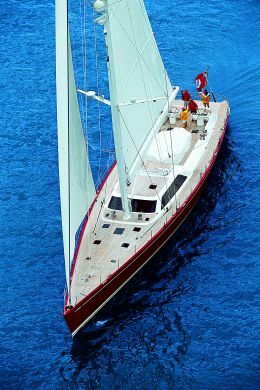 The owner has a suite in the far stern with central double bed, corner for office and relaxation and private bathroom. Towards the centre of the boat we first come across two twin guest cabins and then the roomy saloon, with its own leisure area to port and dining area to starboard. Continuing forwards gives access to a VIP suite or to the service area, the latter directly linked to the quarters for the two crew members. For further information please contact: OY Nautor OB: P.O. Box 10; FIN-68601 Pietarsaari; Finland; tel. +358 6 760 1111; fax +358 6 760 7364; website www.nautorgroup.com; e mail email@nautors-swan.com. Total sail area (spanker-staysail-genoa at 110%): 661.5 sq/m.